I left my house this morning in a stark white t-shirt and came back drenched and covered in caked on red pigment. 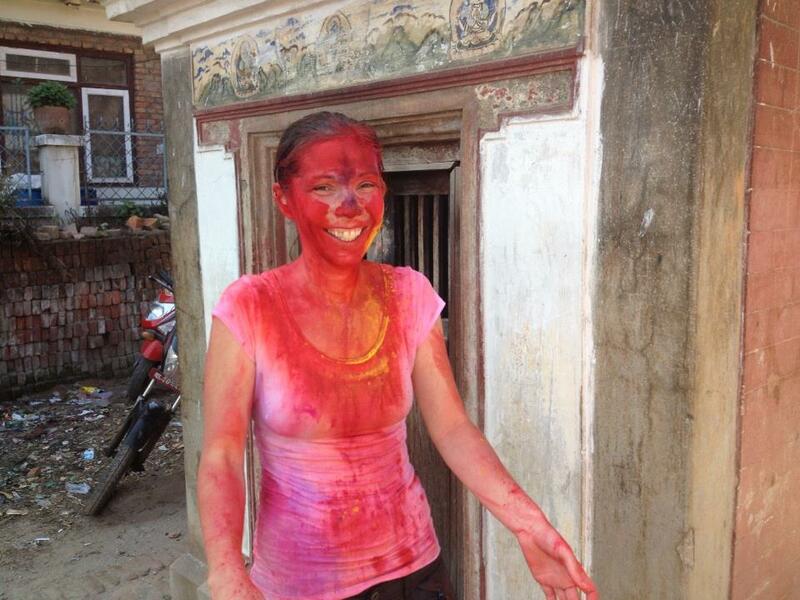 Holi, a Nepali national holiday, is to celebrate spring and represents a story of Hindu religion. As we experienced it today, folks, mostly kids, throw water bombs (plastic bags filled with water, sometimes colored water), shoot water guns, pour buckets of water, and smear color dyes on your face. Some of this is done nicely with a "Happy Hol! ", some quite competitively and some not so nice (especially we've heard depending on the area you are in). Often the water comes from windows or roof tops stories up and when you least expect it. And no doubt about it, when those plastic bags of water hit you square in the back they smart. It was a lot of fun, high energy, and after a few hours a cab ride home sounded fabulous - and though the man that picked us up was a bit concerned about how wet and colorful we were we did our best to keep his cab as clean as it was when we got in.